A video outlining gameplay for the boardgame Caylus. Caylus is the best resource management game I know. Resources are always tight, so you have to think carefully to make the most of them, but it doesn’t get bogged down in calculations. The competitive worker placement forces you constantly reconsider and reprioritize, and the provost(which lets you deny your opponents their actions if they get too greedy) adds even more tension to this already tight game. The balance is excellent, with even turn order under your control. There is no randomness past the initial set-up, so there is nothing to undermine the strategy. Like any game with little to no luck, the tactics in Caylus are unforgiving, with no room for error. But it is not just number-cruncing: there is subtlety in deciding when and where to push. Part of the key seems to be moderation – it is important to build as much as possible each turn, but at the same pushing too hard for one great turn is usually a mistake. You have to be careful not to overextend yourself. Also, while in the end the game is about points, in the meantime it is really about resources: gaining a resource advantage over your opponent and using it to scare them out of the castle. Caylus does have a couple of minor disadvantages – it is a little long, it can be a little dry, there isn’t a whole lot of opportunity to form long-term strategies, and I wish that the favor tracks were more balanced. Overall, though, Caylus is a fascinating resource management game that really makes you think hard about every move. Caylus works great with 2-players, and that is how I have mostly played it: 2-player with my wife. Some feel that is weaker with more players (although others prefer it that way); the few muliplayer games of it I have played also seemed like a lot of fun. In particular, the provost can become much more active with more players, so you really have to watch the way the mood is swinging that turn. Play-length is a little bit on the long side – even as experienced players, a 2-player game takes us 1.5-2 hours, and with more or newer players it is more like 2-3 hours. More than that, it feels intense and draining the whole way. It’s not something to pull out unless you are up for the experience. But if you are up to it: wow, what an experience! 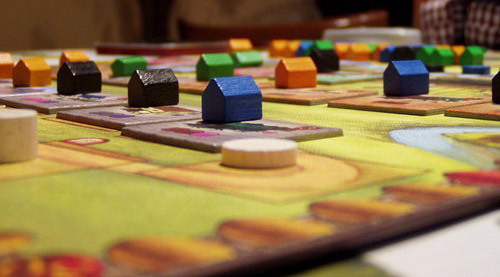 Caylus was one of the first modern board games I played (along with Puerto Rico and Power Grid). A few years have passed. I joined local gaming club. Played many, many, many games. And it still is my favorite game. Many games use worker placement mechanics, but they lack provost – this little guy who tells what works and what doesn’t brings interaction to the new level and does it perfectly – the fight for resources is brutal, but at the same time clever placement will let you benefit no matter how it ends. If you place correctly harming you will be bound to harming other players, brilliant idea. Why aren’t new worker placement games like that – loads of interaction but relatively little chaos. Even with 5 players its not that easy to bash clever leader and with experienced players there is so much control. It is brutal fight for every point you can get, so the game really shines with competitive players of similar skill. (when you don’t try your best to get points the game will become boring) There are many rules and some mechanics are not that easy to grasp so you’ll probably need to play more than once to appreciate this game. But I still don’t know of any better game… and i would really like to see one. That’s right, Agricola has to take a step back and make room for the real king of strategy/resource management games. I’m not gonna lie, it’s a tough game to learn at first, but the rewards of learning the game are great, as a new element is added to the traditional building/resource gathering that I’ve never seen before: the provost. What is the provost? The overseer of construction, which adds a very realistic element to the game: a manager to oversee your work. Everyone can influence him with money to either pull back or move ahead, which can halt your work, making all your efforts and investments worthless for the turn! This results in a VERY cutthroat strategy game, that I have grown to absolutely love. A must have for any true strategy game fan! Game is over complicated and seems like a chore. It can drag on forever and is prone to analysis-paralysis. It gets progressively worse with more players cause the placing of provost is hard to predict. Many don’t like it, but those who do, love it!